This is an advertisement for James Allen’s bottle opener. The Victorians loved gadgets and inventions that made their lives easier and bottle openers are a good example of this passion. Many bottles were manufactured in the late 1800 and often they required a patent device to open them. These openers were often given away as promotional materials and had advertising slogans and cartoon figures on them. 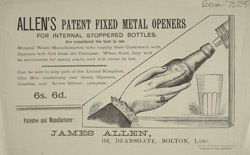 The bottle opener featured in this leaflet is attached to the wall and when bottles are inserted and lifted the lids are prised off the bottles.